The three ingredients for the long-term survival and success of family enterprises is distilled by Professor John Davis in his capstone framework of family enterprise sustainability. In almost every culture in the world, there is a saying, “from shirtsleeves to shirtsleeves in three generations.” This universal adage describes the trajectory that many, if not most, family enterprise systems face as they move from the first generation founder (or wealth creator) to the second generation of siblings, and finally to the third generation of cousins. The axiom says that wealth builds rapidly in the first generation, is generally maintained in the second generation, and often declines significantly or entirely in the third generation. After studying the trajectory of wealth across generations, John Davis has identified the reasons for its decline and the practices that lead to its growth. The three-generation rule described above is not inevitable; it is a choice. 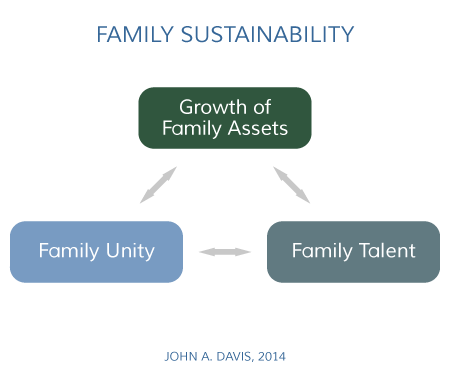 Families that defy it, and regenerate their wealth over several generations, follow the practices described in John Davis’ Family Enterprise Sustainability Framework. The framework is represented as a triangle, with three focal points: Growth of Assets; Family Talent; and Family Unity. Growth of assets is attained by adopting a portfolio approach to the family’s assets and businesses, including prudent diversification. Family unity and talent are essential to support the bold decisions which must be made in order to continue to grow the assets of the family and maintain family financial discipline. This is the foundation of a multigenerational wealth strategy. In order to endure for generations in a sustainable manner, families need to grow their financial assets while maintaining unity and building talent. The three factors, Growth of Family Assets, Family Unity, and Family Talent, are vital for ongoing family success and are skillfully managed by many of the leading families around the world. The family provides the emotional and financial foundation for our society. Receive the latest research, articles and insights from John Davis. © Copyright . John A. Davis. All Rights Reserved.